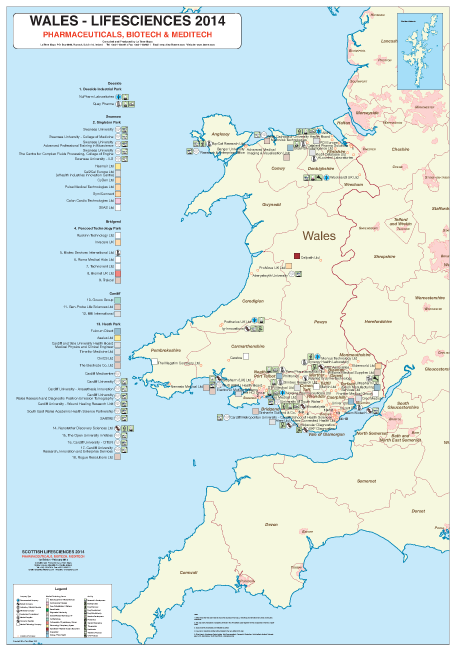 This is the second published map available on this subject area for Britain. It includes Pharmaceutical and Biotech Companies working in R & D, Drug Development and Manufacturing. Genetic Engineering. Human and Veterinary companies covered. The map shows the location and company name for each company. A specifically designed symbol indicates company type and a further set of symbols indicate the type of activities the company is involved in. Researched and Produced by La Tene Maps. This is the first edition of a published map on pharmaceutical production in Europe. It focuses only on manufacturing in the areas of Veterinary, API's, Generics, Vaccines, Contract Manufacturing and General drug manufacturing. Some Nutrionals manufacturing sites are also shown. Each type of site has its own special symbol together with site name and operating company. 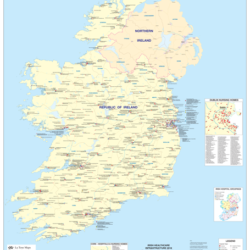 This is the first published map available on this area for Ireland, North and South. It includes Pharmaceutical and Biotech Companies working in R & D, Drug Development and Manufacturing. Both companies working in Human and Veterinary Pharmaceuticals are covered. The map shows the location and company name for each company. Researched and Produced by La Tene Maps. Researched and Produced by La Tene Maps. 2nd Edition 2018. This is a new map in the Lifesciences series and primarily shows the distribution of Hospitals, Nursing Homes, and Hospices in the Irish Republic. Each site is shown by symbol and is named. Hospitals are differentiated into type by symbol color (general, community, geriatric, disability or specialist. 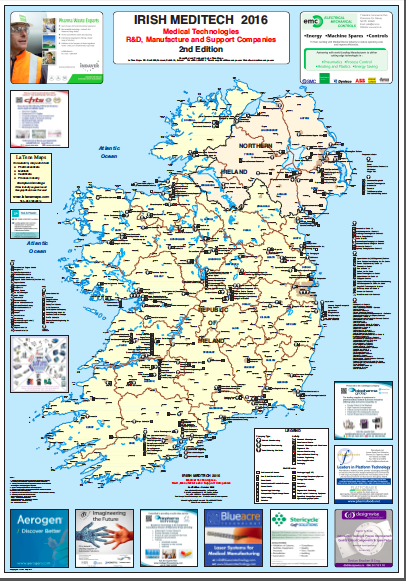 Insets on the map are included for the Dublin and Cork areas. An additional inset map shows the new Irish Hospital Groupings areas set up recently. Additional information on the map shows the location of public and private ambulance services and the location of Medtech companies in Ireland. Current edition 2016 -2nd Edition. This is the first published map available on this area. The map shows the companies working in this sector by activity: research and development, manufacturing, service, etc as well as showing what part of the health sector the companies products are aimed at ; eg Cardiovascular, Dental, Gynaecology, Orthopaedics, etc. The map shows the location and company name for each company. Researched and Produced by La Tene Maps. 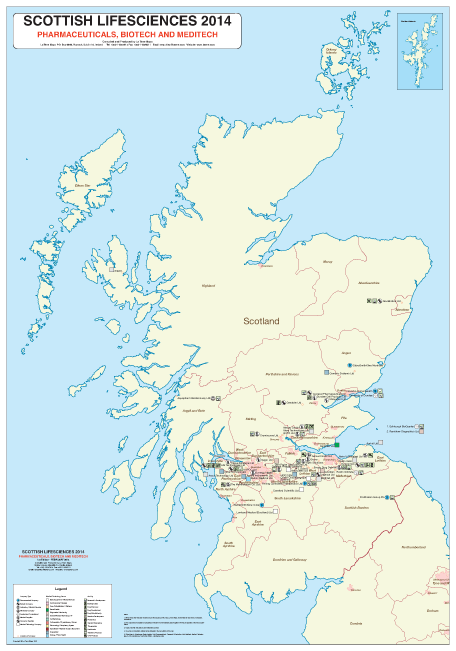 This is a draft map and the first map on Scotland that combines the Pharma, Biotech & Medical Technology Sectors. The map includes Pharmaceutical and Biotech Companies working in R & D, Drug Development and Manufacturing, Medical Device R & D and Development. The map shows the location and company name for each company. A specifically designed symbol indicates company type and a further set of symbols indicate the type of activities the company is involved in. Researched and Produced by La Tene Maps. 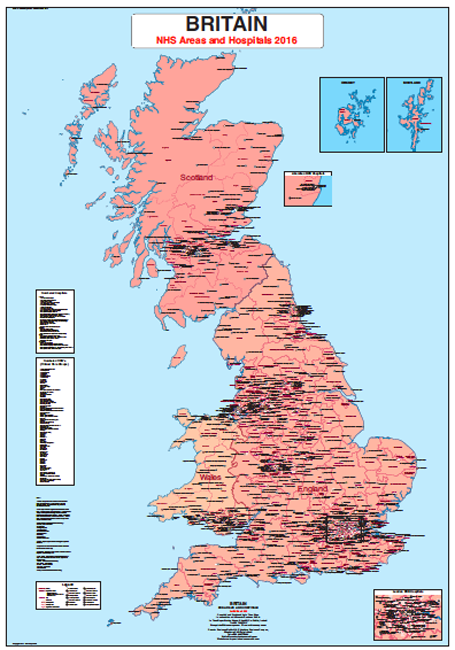 This is the first published map in our regional series of maps on Life-sciences in the UK. 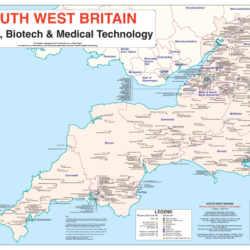 The map combines the Pharma, Biotech & Medical Technology Sectors. 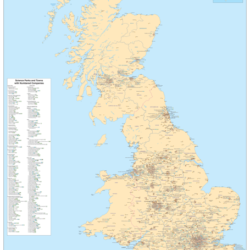 The map shows the location and company name for each company. A specifically designed symbol indicates company type. It includes Pharmaceutical and Biotech Companies working in R & D, Drug Development and Manufacturing, Medical Device R & D and Development. Researched and Produced by La Tene Maps in association with Premier Business Media and Life-sciences Healthcare Ltd.